Where do I begin to put into words what happened in a weekend? I first give honor and glory to God because He is my every reason. My reason to live, the breath in my body, the reason I could stage on any stage to sing of who He is. It’s never been my ministry; it is His and I am just His vessel being used. I wanted to write what my heart felt as I sat on the plane headed back home after a weekend filled with outpour, infilling and hope. I am forever amazed at the love of God and just how far He will go to prove His love to us, even though He doesn’t have to, He does. My team and I packed up and headed to the airport on Wednesday, run sheets, and agendas in tow. A full itinerary laid out. Pretty much everyday jam-packed with run-throughs, interviews, and rehearsals. I was excited, slightly anxious, expecting and ready. I knew God was going to do something great in Las Vegas. I knew this would not be an ordinary trip. I didn’t know what the extraordinary was at the time, but I knew it was going to be great. Now, hear me, I always prepare and expect the great of God when He sends me anywhere, but this time just didn’t feel like anything I had felt before. I had been praying and requesting of God some pretty significant things that had been in my heart. I prayed expecting to see God move. When we landed, I felt the excitement in the atmosphere. We headed to the hotel, got settled and my road manager took me through the plan for the day. 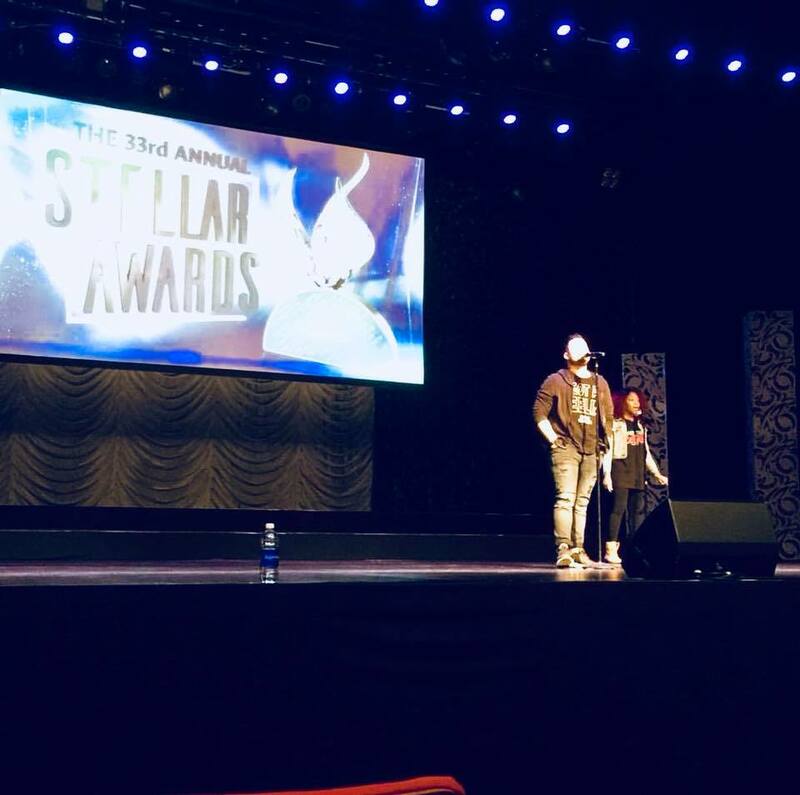 While he was telling me about the schedule for the Stellar Awards Artist Showcase, I couldn’t tell anyone just how anxious I was for the showcase to actually get here. I kept asking God to “keep me genuine, don’t let me be someone else or ‘perform’. I just want to play for the audience of One”. I knew I didn’t look like anyone else, and I didn’t sing or sound like anyone else in the showcase, but my difference was what made the difference. I was reminded that it wasn’t about my voice, it was about the sound that God had given to me. Isn’t it cool how God will give us something that makes us so different that we stand out without trying and our difference is what changes lives. Joseph had a coat that made him different. His coat of many colors set him apart. David had a slingshot. It set him apart. I had a different look and a unique sound. It set me apart. This showcase wasn’t going to be about the competition, it was going to be about the purpose. Fast forward to the showcase day. Rehearsals and run-throughs had been done. There was nothing more to do. Now it was time. I was nervous. No, for real, I was ready, but I was nervous. Don’t tell me you wouldn’t have been nervous too. But nerves and all, I took the stage and “release the sound” was what I was there to do, and I did. When it was over, it was like a weight dropped off my shoulders. I stayed true to who I was, I didn’t compromise, I wasn’t anyone other than who God made me; the worshipper. I knew God was proud of me. In the time I spent there, I met and connected with some really amazing people that I am blessed to now know. It’s awesome how God can connect so many dots in such a short time. Now let me to jump ahead to Sunday because I told you in the beginning that I had this feeling of the extraordinary in my spirit and I prayed EXPECTING God to move. I didn’t expect God to move according to my will, but according to His will and plan for my life. Through the entire weekend, I watched God connect, link and set things up so strategically there was no way for it to be explained any other way, but God. Sunday morning, I woke up and I started preparing to minister that morning. I wanted to know just what God wanted to release through me. Something I have learned in my walk with God is this, we don’t minister from a place of empty, we minister from our overflow. It’s in our private time with God that He fills us to overflow, and the overflow is what the people receive publicly. It’s hard to fake overflow. That night, we had planned to see a show before we would be leaving the next morning. I could have never imagined what would happen. It would be the night that I would cross paths with a man I have respected, looked up, been inspired by, and listened to his music for years, Kirk Franklin. In the most unusual way, God allowed us to meet. It wasn’t in the hast of the crowds during the awards show, it wasn’t in the mix of chaos, it was in the hallway of a show. Turns out he knew me too. The cool thing was that he loved the song “Got A Feelin” that had been playing on his Sirius station for months. I got to talk with him in the most genuine exchange I have ever experienced. He was so humble and so genuine. I was encouraged, I was humbled. It was more than the exchange of words, it was the heart. It was that God heard my heart and all throughout the weekend, it was God setting stages that proved my character, purpose, and willingness to remain in a posture that was pleasing to God. This was the extraordinary of God. It was the final seal of how God will set you up in a way that He gets all glory and leaves you speechless. I sat on the plane the next day, still in shock, awe, and just blown away. Man, my heart was just full. I was going back to San Antonio renewed. Yeah, worshippers need that too. Artists need that too. I sum the weekend up by saying that when you focus on pleasing God, God goes past what you can pray for, hope for, or dream of. I’ve been left speechless by the love of God.